Method If you are starting with frozen raw shrimp, defrost them by placing them in a bowl of ice water until defrosted. Then poach the raw shrimp for 1 to 2 minutes in boiling water, remove from pan with a slotted spoon, and rinse under cold water to stop the cooking. If you are starting with frozen cooked shrimp, you can defrost them in a bowl of ice water or lemon juice with ice. Place strained cooked shrimp in a bowl. Add lime or lemon juice, some chopped fresh jalapeno or serrano chile and/or a dash of chile powder (can also use chipotle chiles or chipotle chili powder) to desired level of heat, green onion, and cilantro. Let marinate for 10 to 30 minutes. Strain out the juice. Heat a cast iron or stick-free skillet on medium high. Add a small amount of oil (about 1/2 teaspoon) and spread it around the bottom of the pan with a spatula (you could use butter as well). Place one flour tortilla on the skillet. 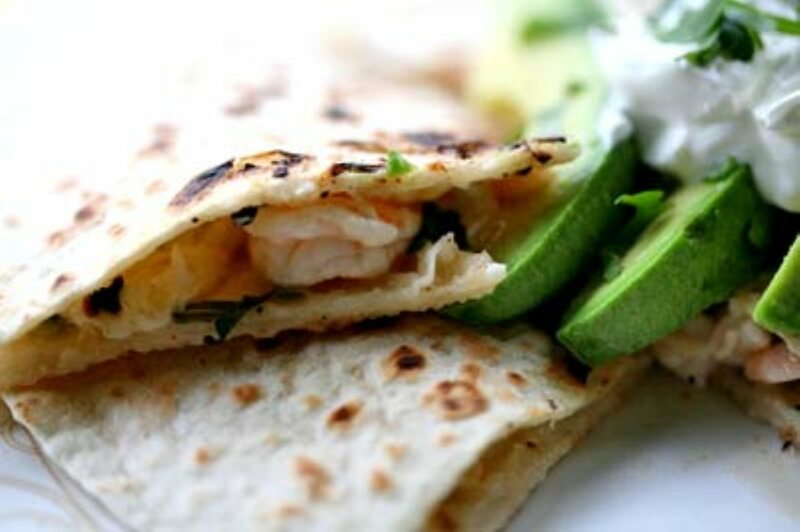 Flip the tortilla over a few times, 10 seconds between flips. Air pockets should begin to form within the tortilla. Remove the tortilla and repeat with the second tortilla. Leave the second tortilla in the pan and reduce the heat to medium. Sprinkle the tortilla with the grated cheese. Distribute the shrimp mixture on top of the cheese. Place the other tortilla on top. Using two spatulas (one to hold the top in place) flip the quesadilla over when the bottom tortilla is nicely toasted and the cheese has begun to melt. Remove the quesadilla from the pan when the now bottom tortilla has toasted sufficiently. You can also use just one tortilla instead of two, and fold the tortilla over itself like an omelette. Cut like a pie into six pieces. A pizza wheel works well for this. Serve with avocado slices and sour cream. Garnish with chopped fresh cilantro. Serves one..